Kirchner takes Manhattan, July 24, 2003 (Photo: Dennis Callahan/AFP-Getty Images). A sentence that Néstor Kirchner is fond of repeating illustrates precisely the path Argentina wants to take vis-à-vis the world: “Politics drags the economy, and not the other way around, as they had us believe for years.” Last week, Kirchner outlined a new direction for foreign policy, which he considers a cornerstone of his administration. He first met Tuesday [June 10] with U.S. Secretary of State Colin Powell at the Casa Rosada [Argentina’s presidential palace]. It was an hour of frank dialogue, which produced the conclusion: The government wants help to negotiate the foreign debt, but it first needs internal stability. Powell took note and promised to relay the idea to President George W. Bush. Kirchner was impressed by the United States’ chief diplomat and emphasized a concept that Powell had put forth during the conversation. “Brazil is a leader on account of its size; Chile is a conceptual leader. You should find a different formula that sets you apart,” stated Powell at the meeting. That idea captured the imagination of the government’s front line. Kirchner believes Argentina should end its automatic alignment with the United States and that his country can play a fundamental role in Latin America, especially if it can bring about serious integration with Brazil and make radical changes in its public sector. With those ideas in mind, Kirchner left for Brasília a couple of hours after Powell had flown to Washington. On Wednesday, Kirchner met for the third time in a month with [Brazil’s] President Luiz Inácio Lula da Silva, whom he enthusiastically calls his “new friend.” They spoke alone for an hour and dedicated another three to discussing the principal themes of the bilateral agenda with their ministers. Afterward, in the presence of the entire local press, the two presidents announced that the decision to politically integrate Mercosur [the Southern Common Market, comprising Argentina, Brazil, Paraguay, and Uruguay] “was irreversible” and that the deadlines for making good on that long-standing promise would be shortened. “The union between Argentina and Brazil will encourage the other countries in the region to realize the dream of continental integration,” said Lula. Kirchner echoed Lula to the word. Kirchner’s visit to Brazil, the first of his term, bore the desired fruit: a strong gesture of alliance with Brazil and a handful of pronouncements of diplomatic impact, such as the will to present a united front in negotiations to enter the Free Trade Area of the Americas (FTAA) and to form a Mercosur parliament. “This time it’s for real,” said [Argentina’s Foreign Minister] Rafael Bielsa at the end of the summit. In his first meeting with Brazil’s Foreign Minister Celso Amorim, he had used an ironic method to question the way bilateral relations had been managed during recent decades. He asked his interlocutor to listen to him for five minutes without interrupting and he read a selection of verbs culled from all the documents signed within Mercosur: to tend toward, to promote, to coordinate, to endeavor....The list was interminable. “We must do away with rhetoric and move on to action,” he said. Lula’s position seemed in line with Kirchner’s foreign-policy plan: With political fortitude, economic objectives will be attained more easily. “If we tarry with commercial conflicts, we will continue to move backward,” Lula maintained during the working meetings. Lula and Kirchner’s synchronicity impressed some Argentine diplomats. “Before, when we would speak with Brazilian authorities, we had three litmus tests: what is said, what is not being said, and what they want to tell us. Now there is only one message,” explained a presidential spokesperson. The government knows that it cannot yet count on Brazil to negotiate with international institutions while Argentina is in default. 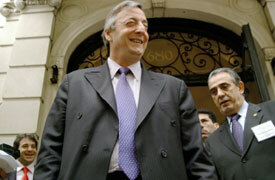 However, regional political strength will give impetus to the national position, Kirchner believes. The same concept holds for the intention to expand Mercosur: Lula and Kirchner spoke of enticing Peru and Venezuela. And they hope Chile will finally join as a plenary member, although that nation signed a free-trade agreement with the United States this month. “The government of Chile is acting with great generosity,” a source close to Bielsa pointed out. During his meeting with Powell, Kirchner outlined his idea of a renegotiation of the multilateral debt tied to trade surplus and growth, with extended deadlines and a cut in interest rates. The United States promised concrete aid at the meeting that Economy Minister Roberto Lavagna held Thursday in Washington with the No. 2 official at the Treasury Depart-ment, John Taylor [undersecretary for international affairs]. The time for effective negotiation is dizzyingly near: In September, Argentina will again face million-dollar due dates with international lenders. Lavagna appears to be motivated by the philosophy that gives primacy to politics over economics. In fact, he was a pioneer of that strategy with the International Monetary Fund (IMF) during Eduardo Duhalde’s government. The following weeks will prove decisive for the success of that strategy. Wednesday, Brazil and Argentina will set forth in Asunción the relaunch of Mercosur (aside from what has already been negotiated). They will speak of promoting a harmonious regimen of public services, coordinating a plan of infrastructure integration between countries, and creating a system of joint purchasing, social cooperation, and significant immigration reforms. A week later [June 23], Horst Köhler, the IMF’s head, will arrive. He is one of the most stubborn opponents of the new Argentine position but at the same time the holder of a key that may open the doors to an improved financial future.